The trial of senior members of the banned Islamic Party of Azerbaijan on charges of terrorism and plotting a government coup again has centered attention on the hyper-conservative Baku suburb of Nardaran, where the party got its start. A largely agricultural town of around 8,000 people, Nardaran is located only 20 miles northwest of Baku, but is seen by natives and outsiders alike as a different world. Billboards of the late President Heydar Aliyev, ubiquitous elsewhere in Azerbaijan, are not to be seen here. Instead, pride of place goes to murals citing the sayings of Imam Hussein, the first imam of Shi’a Islam. No national police are allowed into Nardaran and no pork or alcohol is sold in its vicinity. 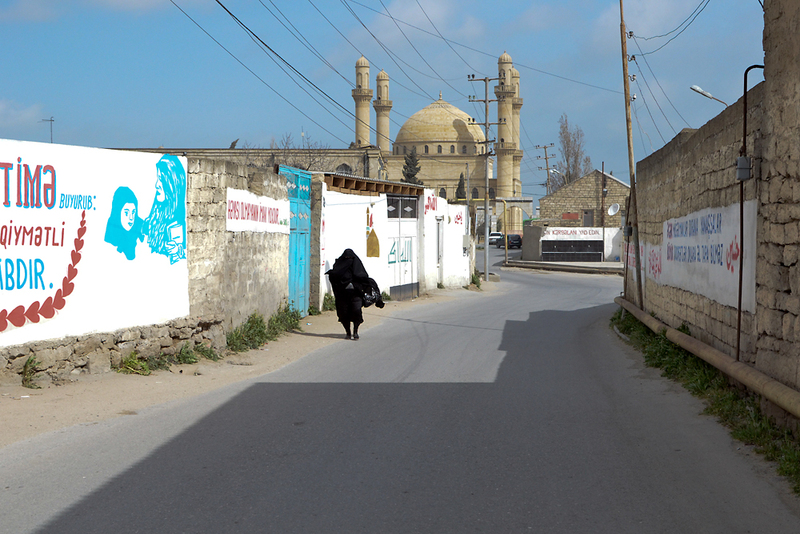 The majority of women are fully covered in black chadors and religious graffiti written in Azeri, Russian and Arabic adorns its streets. “Nardaran is a separate republic,” commented a local policeman. Known for its fiery religious rhetoric and devotion to Shi’a Islam, the town proved a natural headquarters for the Islamic Party of Azerbaijan, which was founded here in 1991. The party lost its registration in 1996 over suspicion of its alleged ties to Iran, but is still influential in Nardaran. The group played a leading role in organizing protests in 2002 over living conditions in Nardaran – when residents kept police from entering the town -- and again in 2006, which left several dead. The demonstrations left Nardaran with a reputation throughout Azerbaijan as a volatile and potentially even dangerous hamlet. That reputation is unlikely to change in the near future. Chairperson Movsum Samadov and six other party members are now on trial for allegedly plotting an armed terrorist attack and attempting to overthrow the government. The charges came following Samadov’s denunciation of the government’s informal ban on wearing hijab, the head covering for Muslim women, in public schools and universities. On August 11, the party’s deputy chairperson, Arif Ganiyev, and the editor of an Islamic news website, Ramin Bayramov, were also arrested, RFE/RL reported. Bayramov has been charged with narcotics and weapons possession. But Hussein Aliyev, son of the late founder of the Islamic Party, Haji Alikram Aliyev (no relation to President Ilham Aliyev), cautions against drawing too tight a connection between the town and the Islamic Party. “Nardaran and the Islamic Party are not the same thing,” he said. While Nardaran’s relative isolation and close-knit community may make for a protest incubator, one observer commented, politics does not necessarily enter into the mix. Altya Goyushov, a religious scholar at Baku State University, agrees, rejecting pro-government media descriptions that suggest Nardaran doubles as a hotbed of Iranian-style Islamic fundamentalism. “They watch Iranian TV, respect Iran, but it’s not that Nardaran people are puppets of Iran. It's not true,” Goyushov said. A few confrontations between locals and wealthy landowners over purchases of summer houses around Nardaran – including businessman Araz Agalarov, father-in-law of President Aliyev’s daughter, Leyla -- has “played right into the government’s propaganda” about the town, he continued. Nonetheless, the central government recently has taken steps to tighten Nardaran’s ties to Baku itself. Once focused on selling flowers throughout the Soviet Union, Nardaran has seen its economic fortunes plummet since the USSR’s collapse. Members of the local council of elders, an elected authority that exists in parallel with the centrally appointed mayor, estimate Nardaran’s rate of unemployment at 90 percent. Some locals complain that they cannot find work outside of the town because of the stereotypes associated with its residents. One economic factor in Nardaran difficult to assess is the Islamic Party itself. Some experts and locals maintain that Iran funnels money and influence into the town through the party. Aliyev and other party leaders deny receiving financial help from Iran, but they do acknowledge a close fraternity with the neighboring nation. Aliyev proudly cited the visit of Iran’s ambassador to Azerbaijan to his father’s funeral as an example. In an apparent bid to keep Nardaran’s economic hardship – and any other external influences – from fostering unrest, the government this year offered some 19 agricultural loans of approximately 10,000 manats ($12,700) to be distributed by the local elders, most of whom are also members of the Islamic Party. “These credits are the direct impact of the Arab revolutions,” said Goyushov in reference to the Arab Spring, a phenomenon closely followed by many Azerbaijanis. The desire for economic stability makes Nardaran little different from other Azerbaijani towns. Contrary to popular expectations, “not a single face from Nardaran” was at a May 6 flash protest in Baku against the government’s informal ban against wearing hijab, Aliyev claims. Vladic Ravich is a freelance reporter and photographer formerly based in Baku.